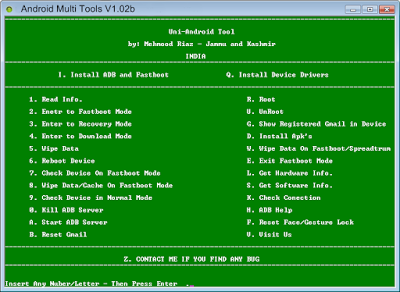 Android multi tools v1.02b latest version is released and is ready for direct download from this web page today. This amazing Android mobile unlocking tool that has been released recently by its developers and shared FREE for all its users around the world. It would be almost impossible to fully describe all the amazing features of this nice tool but still, we would try to make this tool familiar to you so that you could use it easily. Let suppose you forget the pattern of your phone or PIN code and you are about to install a new software to solve this problem. Then download this amazing tool to solve this problem now. You can easily restore all your important data and can also wipe all your phone data with the help of this tool. The amazing thing about the tool is that it is not specifically compatible with only a few mobile brands rather it is compatible with all types of mobile brands and phones. Install this tool and drivers and enjoy its benefits. This tool is gaining popularity all over the world. Not only the common users but the professional users who use these type of Android tools to repair Android devices and smartphones and taking full advantage of this tool to conquer all their problems. You don't need to worry about its downloading and installation process because it is easy and free. Follow the below listed simple steps to Download and install this tool. Download this tool from this website using the downloading link provided to you below. Enable USB debugging on your phone, if it is already enabled skip the step. After installation has finished, connect the phone to the computer. You will see a pop up in your PC and some running of the software, allow these processes to proceed. You will see all the detailed information about your phone. Click any of the tabs to know the info of the described tab. Reset your Gmail account after many repeated tries manually. Flash your phone in a single click and update the firmware of your phone, update the drivers of your phone and finally change the IMEI number of your phone. Before all this, don't forget to take backup of your important data like pictures, messages and ringtones etc, because after this process all this will be deleted and lost. We have already provided you the free and official downloading link of the tool. What you need to do is just click the download button and install it on your computer. If you have problems while downloading you can comment below in the section. We will try our best to help you out. What do you do if you've forgotten your password, so can't enable debugging mode on the device?